It has been four years since we started offering our „Active & Cappucino“ cruises. Featuring a well-done blend of swimming, sunbathing, short bike tours, sightseeing tours, guided walks and easy hikes, these itineraries could be best described as „active light with a twist of culture“. 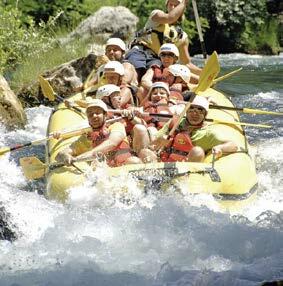 The Cetina Canyon rafting adventure is one of the finest highlights to be mentioned. The program – always accompanied by a guide – is perfect for all those who would like to spend their cruise time not only on the sun deck and in the crystal-clear waters of the Adriatic Sea, but still do not want to participate in daily bike rides of 40 or 50 km or hours of hiking. And of course there will be enough time to relax or to enjoy a cappuccino. Our “Active & Cappuccino” cruise is also suitable for families with children, because kid’s bicycles are available on request. Following the motto “You can do it all – or just relax”, you can decide, which activities you wish to participate in, or if you prefer spending a day or more on board simply relaxing and enjoying your free time. From 11:30 am to 1:30 pm, boarding time in the port of Trogir, our bicycles are awaiting you already on board. If you arrive by your own car, you can proceed to the parking reception (as indicated in your travel documents) already from 10:00 am. Upon arrival, our staff will show you where to park and unload your car. Our service-team will take your luggage to the port. After embarkation, our representatives and guides will welcome you aboard with a drink and you will meet the crew and your fellow passengers. After a lunch snack, we weigh anchor and head towards one of the bays at the island of Čiovo, to take the first jump into the waters of the Adriatic Sea. After a long swimming break, we sail to Split, Croatia’s second largest city and the capital of Dalmatia. The 1700 year old city was built around the palace of the Roman Emperor Diocletian; today it is protected by the UNESCO. After a city tour, we take a guided walk through the forest park Marjan, located on the homonymous mountain (178 m). Today it is a nature reserve, boasting more than 400 different protected plants. 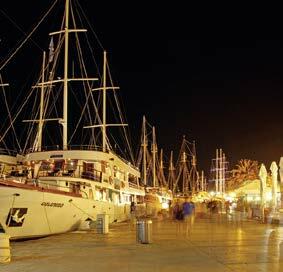 Dinner and overnight stay in the port of Split with its lively atmosphere of a Mediterranean metrop- olis. After breakfast, we will set off for Omiš, a small town, located at the estuary of the Cetina river. In thousands of years, the river Cetina shaped an impressive canyon and created bizarre formations in the stone of the riverbed. The crystal-clear water, the high cliffs – up to 180 m –, the waterfalls and lakes offer sights of an unspoilt nature. A bus will take us to the starting point of our today’s rafting trip, the village of Pavića Most. After being provided with the appropriate equipment (helmet and life jacket), we will get a detailed instruction before starting our 2.5-hour downstream adventure. Inflatable boats for six to eight passengers, steered by experienced skippers, will take us down the Cetina, passing smooth rapids, gorgeous waterfalls, and a simply unique countryside, which is home to many rare birds and other wildlife. On our way, we will make two breaks to have an energy snack and to take a refreshing dip in the crystal-clear water. Our destination is the “Radmanove Mlinice”, a unique spot featuring old water mills and an outdoor restaurant surrounded by an amazing countryside. Take the opportunity to have an unforgettable al fresco lunch (we do highly recommend the “Rafting-Menu”), before the bus will take us back to the vessel. Those who do not wish to participate in the rafting trip will have the opportunity to stroll through the lovely town of Omiš, or to relax and unwind in one of the cafés in the old town. After leaving Omiš, we will set off for a bay to take a swim. Afterwards we will head to the Makarska Riviera, known for its gorgeous beaches of fine gravel, which here, punctuated by short sections of rock, string together like a pearl necklace. Dinner on board and overnight stay in Brela, Baška Voda or Makarska. Today we will continue our cruise south. Our destination is the Pelješac peninsula, which is the second largest peninsula in Croatia and is well-known for its excellent wines, Postup and Dingač. We will anchor in Kućište, from where we will start our bike tour to Orebić, a picturesque town located at the foot of the Sveti Ilija mountain (961 m). After a tour through the town, we will take a walk to the Franciscan convent dating back to the 16th Century (approx. 2 km), located 152 metres above sea level. From here you can enjoy panoramic views over the sea and the opposite island of Korčula. Visit one of Orebič’s cozy restaurants for lunch. Afterwards you are invited to enjoy wine tasting and to assure yourself of the quality of the wines produced in this area. We will return by bike to Kućište (approx. 5 km), where we will have dinner on board. Overnight stay in Kućište. 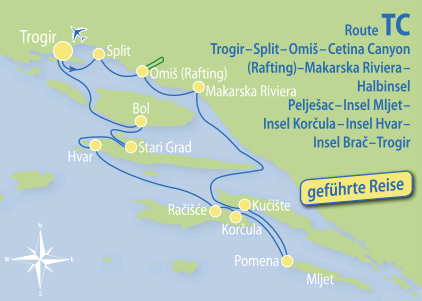 After breakfast, we will leave the Pelješac peninsula and continue our cruise to the island of Mljet. Part of the island was declared a national park – two saltwater lakes (in the larger of the two there is a small island with a former monastery) are connected only by a narrow channel to the sea. We moor in the small port of Pomena, just a few steps away from the entrance to the national park. Enjoy a guided walk through the amazing national park, which also includes a boat trip across the big lake to the monastery island. We recommend that you bring your bathing suit, since the temperature of the salt water lakes is always 2°C above the temperature of the sea. Afterwards we will have lunch aboard, before we set off for the island of Korčula. In olden times, Korčula was also called the “Black Island”, because of its vast pine forests, which used to cover the entire island. Korčula, the homonymous capital of the island, has one of the most beautiful old towns in Dalmatia, and because of its fortresslike appearance it is often referred to as “Little Dubrovnik”. After arriving in Korčula, you are invited to enjoy a complimentary cappuccino accompanied by lovely views of the unique scenery. Overnight stay in the birthplace of the famous sailor and explorer Marco Polo. After breakfast, we will unload the bikes and start our ride to the small place of Račišce (approx. 13 km). Today’s tour will take us alongside the sea and offers stunning views of the surroundings. In Račišce, we will get back on board and set off for the island of Hvar. On our way, lunch will be served, before anchoring in a secluded bay of the small island of Šćedro, where we will enjoy an extended break for swimming and sunbathing. Afterwards we will continue our cruise, heading to Hvar, the capital of the homonymous island. After a guided walk through the city, we will take a 20-minute climb to the fortress “Španjola”. From here, we can enjoy magnificent views over the old town of Hvar and the offshore islands “Pakleni otoci”. After this great experience, we will set off for a nearby bay, where we will spend the night and enjoy Captain’s Dinner. Today we will sail around the northwestern tip of the island of Hvar, heading to Stari Grad, the oldest settlement on the island. Stari Grad (Croatian – old town), once called “Pharos”, used to be the capital of the island, but has lost its leading position centuries ago to the town of Hvar. Even today well-preserved monuments bear witness of the splendour of times past, like the Palace of Hektorović. Stari Grad has, however, kept its role as the centre of viticulture and every year at the end of September, you may see long queues outside the wineries, when growers deliver their grapes. Our today’s bike tour will lead us to Jelsa, a picturesque place, located at a distance of approx. 22 km from Stari Grad. 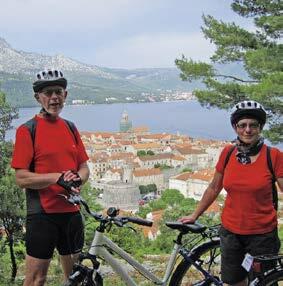 After a break, we will ride all the way back to Stari Grad, where we will get back on board. Afterwards we will set off for a nearby bay to have lunch and to enjoy a refreshing swim in the crystal-clear sea, before we continue our cruise to the island of Brač. In the afternoon, we will visit the town of Bol, known for the most famous beach in Croatia – Zlatni Rat (the “Golden Horn”) – which extends approx. 300 m into the sea. It is a natural phenomenon, because the tip of the beach is constantly changing its direction with the ocean currents, and every few years – during the rare winter storms – the beach is entirely washed away; anyhow, two or three days later it will reappear in all its glory! Take the opportunity to enjoy dinner in one of the cozy restaurants in Bol. Overnight stay in the small port of Bol. After breakfast, we will start our bike tour (approx. 14 km). Passing the Dominican monastery, we will reach the village of Murvica. We will make a short break before returning to Bol, where we will go for a swim at the famous beach “Zlatni Rat”. Afterwards we will get back on board to set off for a nearby bay, where we will have lunch and plenty of time for swimming and sunbathing. In the afternoon we will return to Trogir, the starting point of our cruise. With its amazing old town, protected by the UNESCO, Trogir is also called “the Museum City”. Enjoy the experience of a guided walking tour through the winding streets and discover impressive walls, towers, churches, frescoes and vaults. Do not miss out on taking a look into the unique old yards. Take the opportunity to enjoy dinner in one of the numerous restaurants in Trogir. Overnight stay in the port of Trogir. Rafting through the Cetina Canyon near Omis.